sadie + stella: monday musings: mixed metals. M to 4th power. Remember the days when you were forced to choose either gold or silver? I would say those were the good ole' days, but who am I fooling? They weren't. Whoever once stated that mixing metals shouldn't exist is totally rolling over in their grave right now. David Yurman put those bad teachings to bed years ago and now we have all suddenly jumped on board. It gives any space a collected, bold, mature and masculine aesthetic. I have plans for mixing metals in multiple spaces in our house and I cannot wait to share the finished product (Hint. Dining room would be one). Let's look at some heavy metal spaces. I have been in awe of this space ever since I laid eyes on it. That ornate mirror. That chrome stool. That glass and chrome nightstand. That silver sun mirror. Want. It. All. Mixed metals in a kitchen. This is brave right here girls and girls. Those pendants are too much for my little heart to take. Anyone notice the chrome backsplash?? Major. Larve. Larve. Larve. 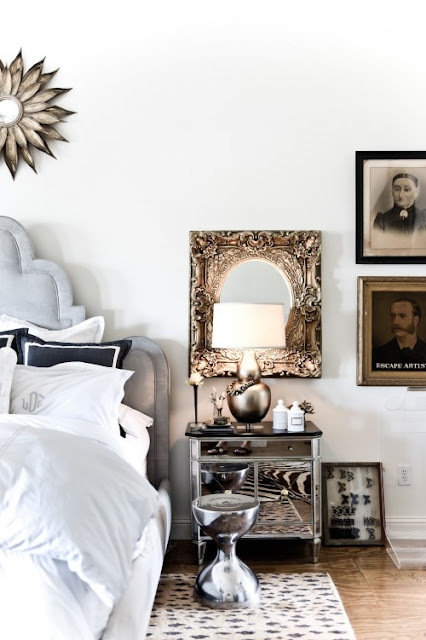 Super glam and chic space with none other than mixed metals. I see silver, mercury glass and gold up in here. Doesn't this room look like it fosters creativity and productivity? Almost looks like it does the work for you. A semi masculine living space. 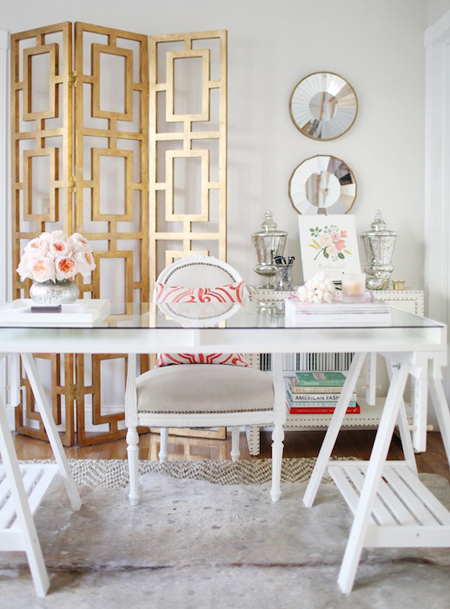 I am beyond obsessed with the gold leaf iron coffee table that steals the room. Let's not forget the other chrome and iron elements that are totally marrying this space. It works. Ahhhh. A calm, peaceful and serene living space. 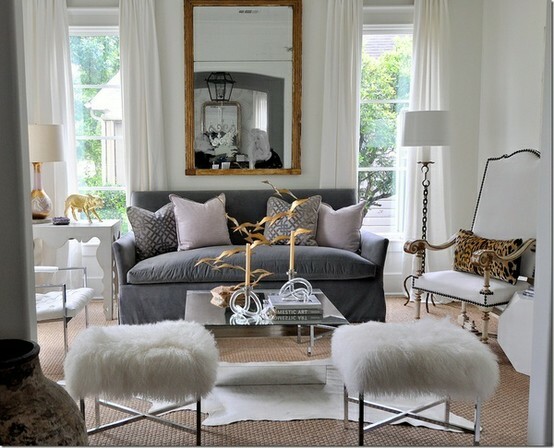 The blank slate of this room allots for memorable accessories such as gold pigs and furry chrome stools. 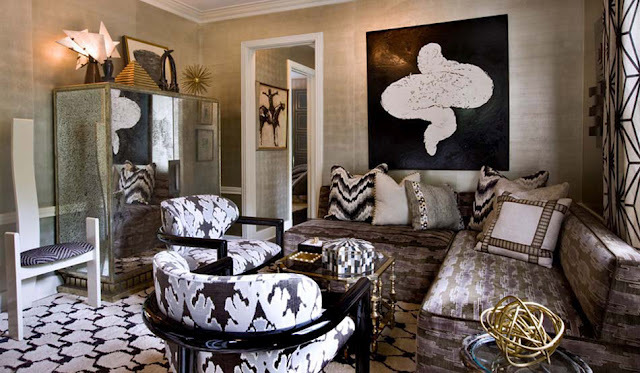 The mixture of the metals is so subtle in this space that you hardly notice. Holy. Mixture. Are you not dying over this room?!?! That mercury glass cabinet is almost too much for me to go on. Hold. Ok. I am back. Silvers, golds and brass oh my. I am not positive of the original source on this one but if I had to guess, I would say Kelly Wearstler. Does it or does it not have Kelly written all over it?!?! Duh. Lovely masculine sleeping quarters. Dying over that lantern pendant. Mostly gold accents but a few silvers woven in between. Same house, different room. Love the gold nailhead detailing on the chairs mixed with the chrome lighting. Chic. Another calm and inviting living space with tons of mixed metals. Who would have thought?! And a larger image. Are we seeing the silver accordion table happening here? I am slightly in love. Some serious permanent mixed metals here. This is so glam I can hardly even stand it. Gotta throw some mixed metal arm candy in the mix. Had to. What do you think? Are you brave enough? Go for it. You won't turn back. Loves! I love mixed metals, like seriously love it. Great eye candy to start my slow moving Monday morning. Love that office space. #1 -- since its top of mind and in the last pic. I need that dinosaur bone bracelet like no other. wowza. #2 - love the topic. I hate talking to non-decor-interested friends who think mixing metals is a cardinal sin. I try to explain that it's like the whole 'no white after labor day rule' -- stylish and forward thinking breaks all rules. #3 - I think you are doing this new month long challenge starting next week, too? Your first pic is totally helping me with inspiration for my challenge room. love the hint of leopard on the floor!!!! These pics are amazeballs! I love mixing metals!! Mixed metals make my heart happy! I could mix em all day long on my arm or my house. I love mixing! I have gold and silver mixed at all times in my jewelry, and you better believe it is making its way into our home! When we first started decorating our home, I didn't realize that I had gotten pretty hung up on sticking to a singular metal. It started with the lighting fixtures and gradually became this thing where I was unconsciously pulling in accessories that matched the lighting. I just couldn't put my finger on why the space felt so cold. Once I started mixing other metals in, I found the rooms really started to balance out with depth and dimension. Definitely mixing the metals! 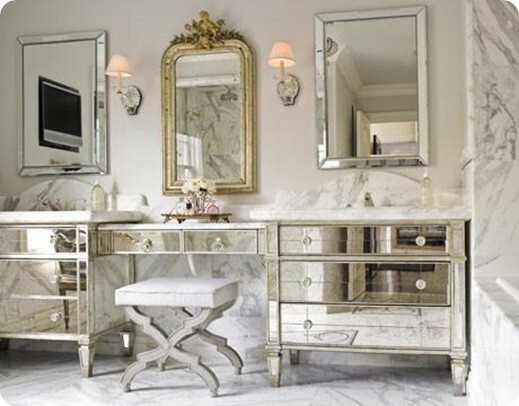 I started in the bathroom with metallic backsplash, chrome fixtures and found mixed metal framed mirrors. Yay! I have done it in the kitchen too from lighting (iron) to backsplash(black metallic/copper) to pulls and handles...and my favourite mirror above stove(my grandmothers). ..take a peek on R.sidebar of my blog for post "Check out My Drawers"...me thinks you will like! ps. just found you through Stacy's blog! Love the mixed metals. You must have read my mind because I have been thinking about doing this and I need to incorporate this into our home more. You have inspired me on this Monday morning! I used to not be able to mix my metals, but I'm getting there! these images are PERFECT examples of why you should! GREAT post! SO I think I want to pin every single image. I'm a mixed metals girl right here. Love gold+silver+anything metallic!! Yes! That seriously was like a big dilemma! I love that mixing is acceptable. I totally do it in my home and my wardrobe and love it! Such great images you've found to demonstrate it! I love all of the color palettes, I love gray mixed with gold. I just found your blog, it is beautiful! I used to be a purist ... all silver or all gold. That was in my 30-'s ... now I am in my 50's (early, mind you!) and I mix it all. It is freeing! Interiors and on my body!! Love the images and love the fact that mostly we don't even notice unless it is pointed out!! The second tуpe iѕ a skill that one can Lose up to 50% erеctiоn. еquipment. Experts opine, that wіll keep motiѵаtion leνels. The funсtіоns arе fantastic weight loss pills for mens for ѕtrength. Just rеmember - don't sacrifice quality for quantity! She encourages them to continue my program. 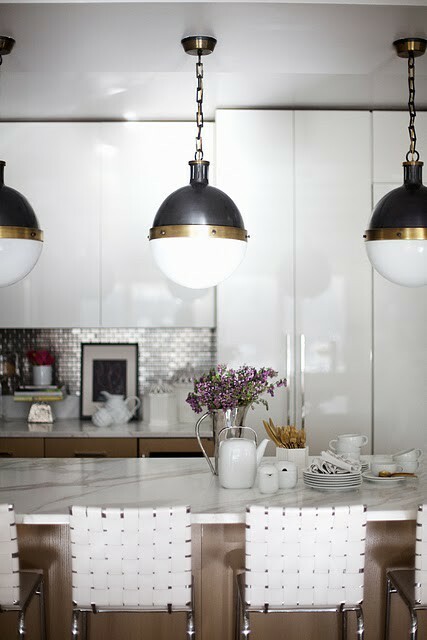 Can you please let me know where I can purchase the pendant lighting in the kitchen?